Whenever we think of the richest man of all time, our minds flash to the western world. We think of the likes of John D Rockefeller, in past history and Bill Gates in current history. It occurs to virtually nobody that anything “world richest” could come from Africa. However, this long-standing belief has been proven wrong by the discovery of the man called Mansa Musa I, one-time emperor of the empire of Mali (1312–1337). His real name is Musa Keita but adopted the name “Mansa” which means ‘king of kings or emperor”, when he became the ruler of the Malian empire, after the death of his predecessor, Abu-Bakr II in 1312. The richest man of all times was born in Mali in the Keita dynasty. History is unable to trace the exact date of his birth. His grandfather was Abu-Bakr Keita whose brother Sundiata Keita was recorded in oral history as the founder of the Malian Empire. Neither did Mansa Musa’s grandfather ascend the throne nor his father, Faga Laye was of any significance in the history of Mali. However, Musa came to power through a tradition of appointing a deputy when a king goes on his pilgrimage to Mecca or some other endeavors. Thus he ascended the throne when his predecessor never returned from a quest to reach the extremity of the ocean that encircles the earth. It also wasn’t clear how many wives and children Mansa Musa I has but his only mentioned spouse and heir was Inari Kunate and Maghan I respectively. 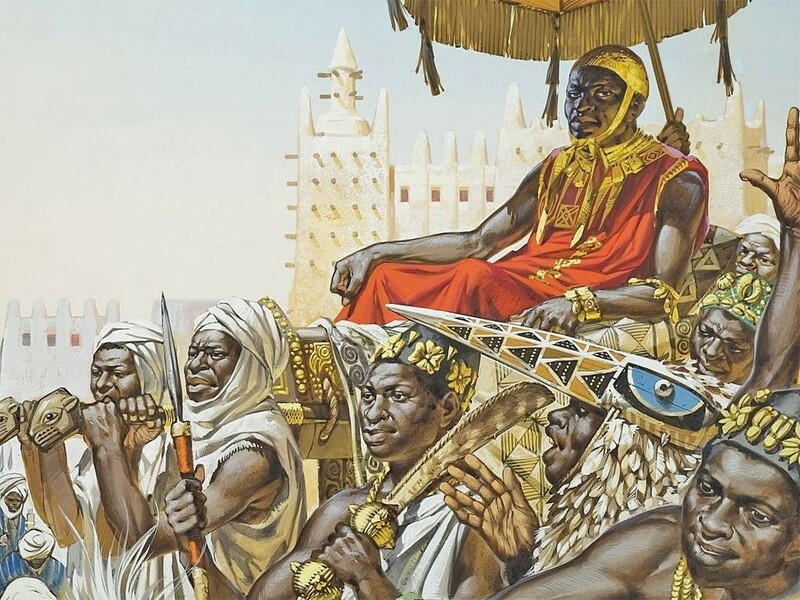 Malian King Mansa Musa I was the richest man in all of the world’s history. According to a new inflation-adjusted list, Mansa Musa was worth a whopping $400 billion, which, incredibly, places him as the No. 1 richest person in history, ahead of the Rothschild family ($350 billion) and John D. Rockefeller ($340 billion). Mansa is known to have made his fortune and fame from the gold and ivory trade that had taken place in Africa during the 14th century. Mansa Musa I, the Malian emperor is mostly remembered by historians both in Africa and beyond for his extravagant hajj, or pilgrimage that he took to Mecca. This elaborate pilgrimage to the Muslim holy city of Mecca which he embarked on in 1324 introduced him to rulers in the Middle East and in Europe. 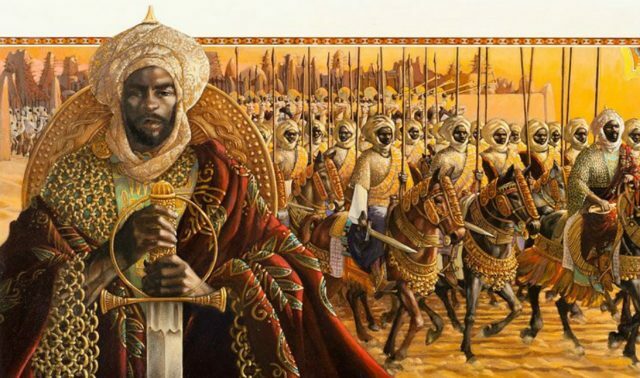 Archaeologists have discovered that Mansa Musa had gathered a massive group of people to take the journey with him. Accompanying the royal couple were 60,000 porters in a caravan of 100 camels, carrying 300 pounds of gold each, 500 attendants of his senior wife, 500 slaves, each carrying a 4-pound gold staff, and thousands of his subjects. According to David Tschanz in his essay “Lion of Mali: The Hajj of Mansa Musa” in the May 2012 issue of Makzan. “Leading the host were 500 heralds, clad in Persian silk and bearing four-foot-long golden staffs glistening in the sun and nearly blinding anyone who looked at them,” Tschanz writes. “Next came the royal guards some bearing spears and sword, others the flags of their empire.” Also in tow, Tschanz notes, was “a retinue of 12,000 of the king’s personal slaves”. The journey took him and his servants over a year to complete. During the famous journey, he stopped off in Egypt and gave out so much gold that the Egyptian economy was ruined for years to come. When he arrived in Egypt, Mansa Musa camped near the Pyramids for three days. He then sent a gift of 50,000 dinars to the Sultan of Egypt, Al-Nasir Muhammad, before settling in Cairo for three months. The Sultan lent him his palace for the summer and made sure that his entourage was treated well. Mansa Musa gave away thousands of ingots of gold, and Egyptian traders took advantage of this by charging five times the normal price for their goods. Consequently, the value of gold in Egypt decreased as much as 25 percent. While he was in Cairo and Mecca he spent so much money that he eventually ran out. With no funds to support his journey back home, he had to borrow a large amount from Egyptian merchants and to rectify the gold market, Musa borrowed at a ridiculously high-interest rate all the gold he could carry from lenders in Cairo. He directly controlled the price of gold in the Mediterranean, reportedly the only time in history one man has done so. Mansa’s reign, which lasted for a good 25 years was that of absolute peace and prosperity in Mali and the surrounding West African countries. According to celebritynetworth.com, the West African nation of Mali, under Musa’s leadership was responsible for more than half of the world’s salt and gold supply. Musa embarked on a large building program, raising mosques and madrasas in Timbuktu and Gao. Most notably, the ancient center of learning Sankore Madrasah (or University of Sankore) was constructed during his reign. Furthermore, it was recorded that he built a mosque every Friday. He designed numerous buildings for the Emperor including a new palace named Madagou, the mosque at Gao, the second largest city in Mali, and the still-standing great mosque at Timbuktu, the largest city in the empire. Mansa Musa I died in 1337, and was succeeded by his son, Maghan I. However, his heirs were unable to sustain their father’s wealth and fortune, and just two generations later, all the wealth was gone – wasted away by civil wars and invading armies. 1. He came to the throne through a practice of appointing a deputy when a king goes on his pilgrimage to Mecca or some other endeavor. 2. Musa was appointed deputy of Abubakari Keita II, the king before him, who had reportedly embarked on an expedition to explore the limits of the Atlantic Ocean, and never returned. 4. During his reign, Mansa Musa conquered 24 cities and Mali may have been the largest producer of gold in the world. 5. The extent of his wealth is regarded as inconceivable. 6. History recorded him as the only one man who directly controlled the price of gold in the Mediterranean. 7. His admiral monuments in Mali was recorded as the foundation of an urban civilization. 8. Musa’s generous actions inadvertently devastated the economies of the regions through which he passed during his pilgrimages as he not only give gold to the poor he met along his route as well as cities, he also traded gold pieces for souvenirs. 9. As a devout Muslim, he brought architects from Spain and Cairo to build his grand palace in Timbuktu and the great Djinguereber Mosque that still stands today, making Timbuktu a center of trade, culture, and Islam. 10. During his reign, Mansa Musa I restaffed the University of Sankore in Timbuktu with jurists, astronomers, and mathematicians, making it a center of learning and culture and attracting Muslim scholars from around Africa and the Middle East to Timbuktu. 11. 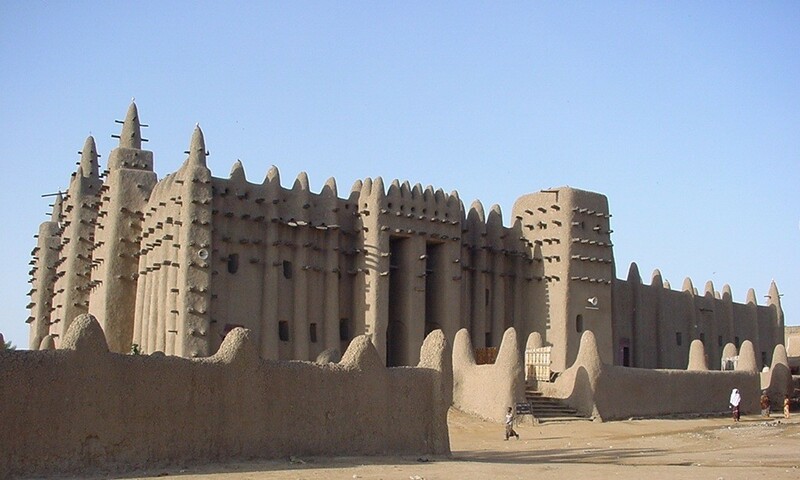 While Musa’s palace has since vanished, the university and mosque still stand in Timbuktu today as part of his legacy.